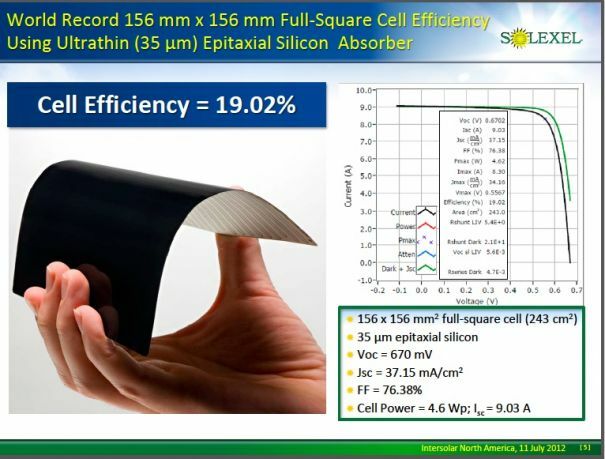 Despite investor flinchiness in a recovering global solar market, Solexel, a thin-silicon solar cell and module builder, just raised $31 million in a Round D of funding aimed at moving the company to commercial production. Solexel added new investor GAF, a large roofing materials manufacturer, to its roster of investors, which includes SunPower, KPCB, Technology Partners, DAG Ventures, Gentry Ventures, Northgate Capital, GSV Capital, Jasper Ridge Partners, and Spirox. The firm's board of directors includes Mehrdad Moslehi and Michael Wingert of Solexel, as well as Ira Ehrenpreis of Technology Partners, Les Vadasz, John Denniston, Jan van Dokkum of KPCB, Larry Aschebrook of Gentry, and Greg Williams of DAG Ventures. Gentry's investments include Fisker, Bloom Energy, Amyris, Agrivida, and Glori Energy -- all Kleiner Perkins portfolio companies. Mark Kerstens, Solexel’s chief sales and marketing officer, as well as its acting CFO, informed GTM that SunPower did not reinvest in this round, although all of the equity players did. The startup's total VC funding to date is north of $200 million. Solexel has also scored $17 million in DOE and NSF grants and is still an active participant in the DOE SunShot program. The 55-employee startup hit an NREL-certified cell efficiency of 21.2 percent in 2014. As we reported previously, Solexel looks to partner in Malaysia to build the cells. The firm currently has a megawatt-scale pilot line in Milpitas which it intends to "copy-exact in Malaysia," according to Kerstens. 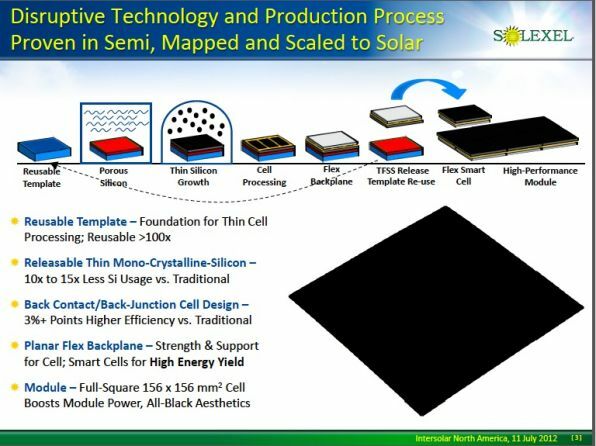 Solexel is hoping to mass produce 35-micron-thick, high-performance, low-cost monocrystalline solar cells using a lift-off technology based on a reusable template and a porous silicon substrate. According to the company's claims, the process ensures that the thin silicon is supported during handling and processing, while the back-contact, n-type cell dispenses with the need for expensive silver, using aluminum instead. The process uses no wet steps, according to the CEO, Michael Wingert, and employs CVD on trichlorosilane gas at atmospheric pressure, with silicon deposited at a rate of 2.5 microns per minute. 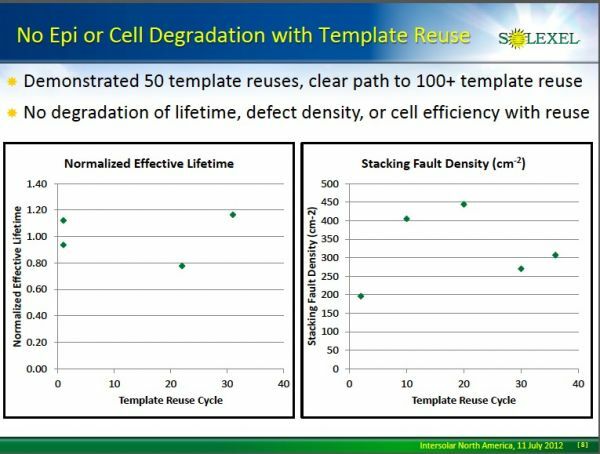 The cell uses nearly ten times less silicon than conventional c-Si cells, at about 0.5 grams per watt. Mehrdad Moslehi, the CTO and founder of the firm, told GTM that at 156mm x 156mm, Solexel produces the largest back-contact cell in the industry. The firm may use a contract manufacturer to construct the modules, which will be available in frameless as well as framed versions. Solexel claims that its cells don't need the support of glass, and it envisions using lightweight, non-glass sandwich panels in future product offerings. A resin and fiber carrier, akin to circuit board material, supports the thin cell and allows a diode to be added for module shading tolerance. Kerstens notes, "Where we've done quite a bit of work is in form factor." 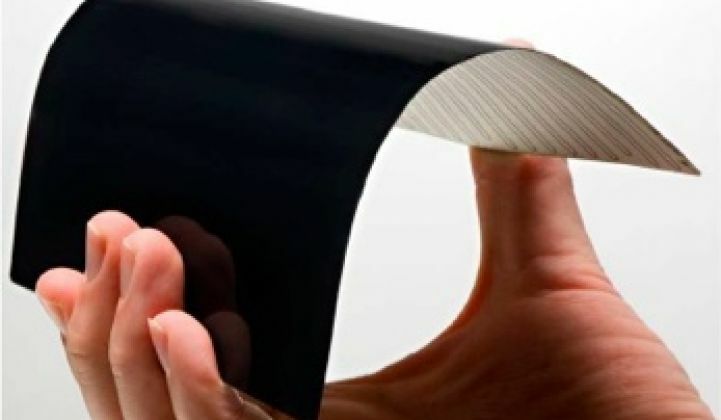 He added that the flexible cells don't demand the standard glass sandwich and aluminum frame, and the company is "excited about working with lighter-weight solutions." That typically means building-integrated photovoltaics or solar tiles for residential usage and lightweight flexible panels for flat or low-slope commercial rooftops. The addition of roofing materials manufacturer GAF to the firm's list of investors is not a coincidence. Other firms in the thin silicon business include 1366 Technologies with its "direct wafer" technology using molten silicon directly converted into wafers, and Crystal Solar using a vapor deposition process for making thin crystalline silicon wafers.